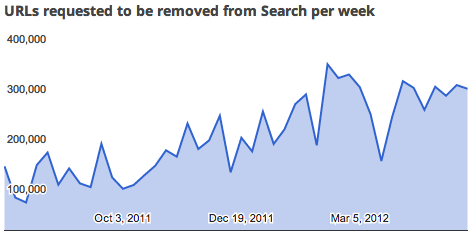 Imagine getting 1,255,402 content removal requests in a month or about 41,000 of them per day! That is what Google says they are getting from copyright owners wanting those who are stealing their content removed from the Google search results. Google said they added to the transparency report "information about copyright removal requests that we [Google] receive from copyright owners and the organizations that represent them to remove Google Search results because they allegedly link to infringing content." You can see that new section over here. The numbers of requests are astounding but most of them come from several major copyright holders and reporting organizations - as you can imagine. The more amazing stat to me is that with all these incoming requests, Google is able to act on most within 11 hours! And Google acts on 97% of them! The issue is, I am a content producer and my content is stolen within minutes of me posting it. I don't have the time to go through the DMCA request process to have Google take down that content from their search results. Most small publishers don't have that time. Wouldn't it be great if this was built into Google Webmaster Tools? Google could show you all the content stealing your content (at least the ones they think) and then you have a quick button to file a DMCA request with all the details prefilled in. I doubt they will do it but maybe someone else should - if it isn't out there already?